Summary: Duncan just wants to color but he opens his crayon box to find only written letters from unhappy crayons. The crayons were so unhappy that they quit! He reads each of the notes. The notes are full of humor but they also express a deep dissatisfaction with their relationships with the other crayons and the crayon users. Duncan just wants the crayons to be happy and find their usefulness to be fulfilling. Duncan comes up with the perfect idea to help all the crayons feel better and meet his desire to color. The author ends with Duncan coloring a perfect picture. It is one that uses every color in new and creative ways. Literary elements at work in the story: The story is full of painterly style illustrations that beautifully compliment the humorous writing style. The illustrations are very bright, colorful, and appear to be created using crayons and other painterly media but they are quite full of composition. There are extensive colors used in the book that are portrayed as individual characters. (How) does the perspective on gender/race/culture/economics/ability make a difference to the story? The gender of the main character, Duncan, doesn’t impact the story. The crayons don’t have assigned genders, which allows the reader to be more openly invited into the story. Each crayon is a different color with a variety of concerns, enjoyments and personality. Several crayons have a stereotypical complaint but it is communicated with humor and fun. Theological conversation partners: We are called to be brothers and sisters in community that work towards reconciliation with others. Christ paved the way of reconciliation through the death and resurrection of Christ. According to Matthew 5, we are able to more fully live into community with others and share our gifts more freely when reconciled. Do you have a friend that has ever upset you but you told them what was upsetting and they remain a really great friend? Can you think of a time when someone hurt you? Did you tell them that you were sad, angry, or hurt? Maybe they did something to help you feel better and help them be a better friend. What could they do to make things better? 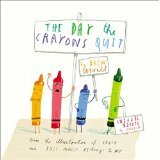 The Day the Crayons Quit by Storypath is licensed under a Creative Commons Attribution-NonCommercial 4.0 International License.